The fruit fly gets their name because they are attracted to fruit and sugary, organic materials which serve as a food source and a place to lay their eggs. Even though fruit flies are most active during the fall harvest, they can be pests inside a home throughout the year. 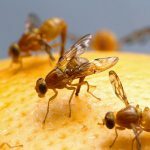 It is extremely difficult to rid a home of the common fruit fly, as they are also capable of breeding in decaying meat, trash bins and large spills of soda or alcohol. Any fruit brought home from the store should be stored in the refrigerator if appropriate. Fruit flies can hitch a ride to your house on produce you buy at the store. If you have ripe produce out the flies can easily get in because they are so small. They can work themselves in through window screens or around windows and doors. They can reproduce quickly and before you know it, you have a full blown fruit fly infestation. Fruit flies will also breed in drains, mop buckets, beer/soda bottles or cans, trash containers, and garbage disposals.